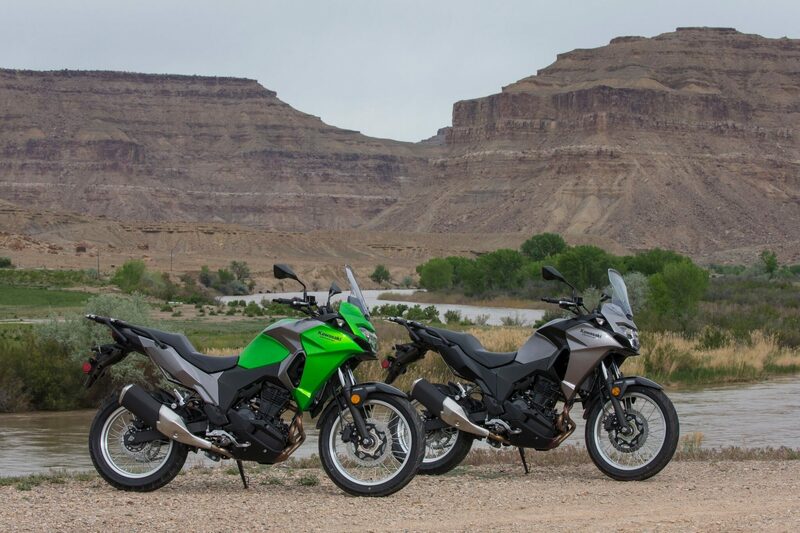 When news of Kawasaki’s Versys X 300 started to circulate, many people thought it was just another also-ran in a growing category of diminutive motorcycles aimed at new or fair weather riders. 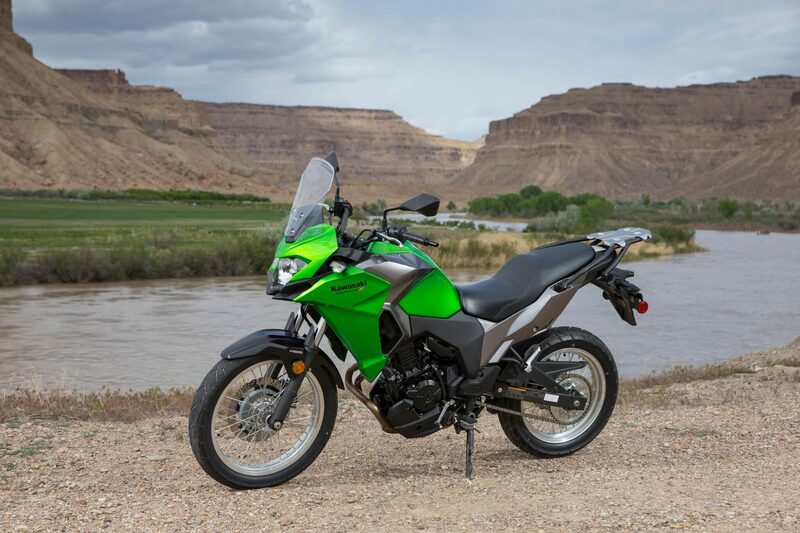 Others thought it might be the KLR’s replacement, which are big shoes to fill. 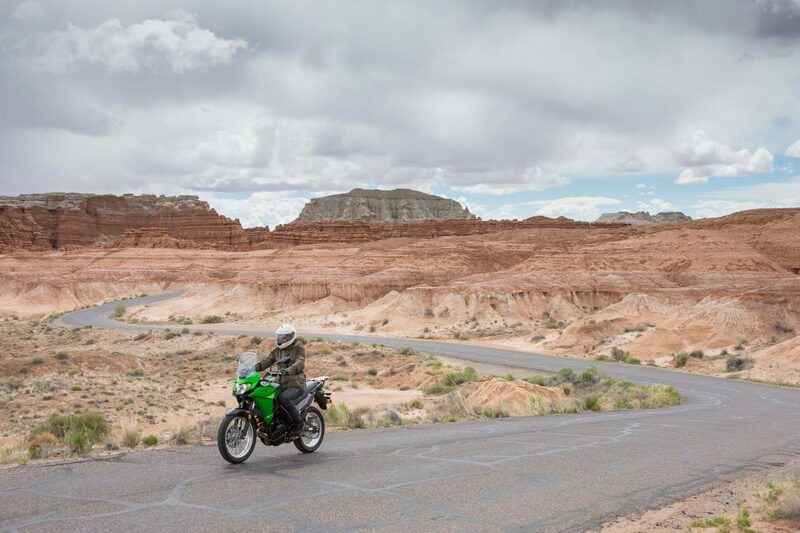 After spending a few days atop the Versys X 300 in the canyons and mountains of southern Utah, I walked away realizing this new bike is something special. 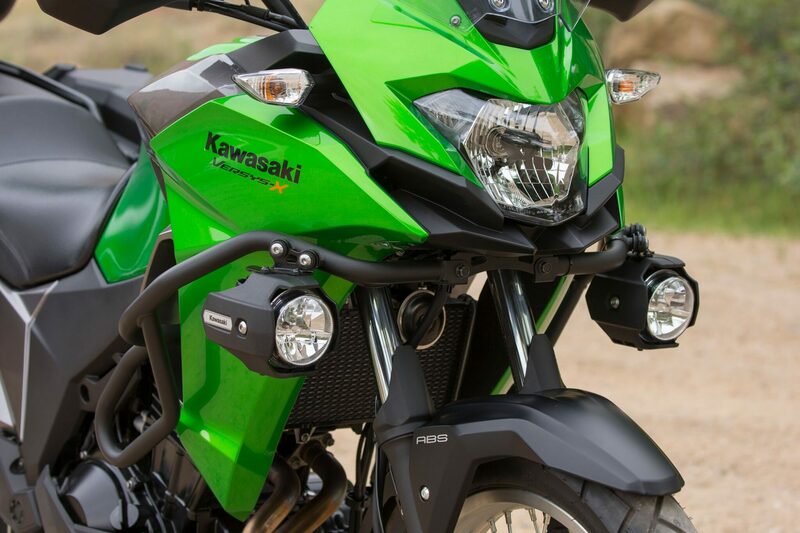 Kawasaki didn’t just dip a toe in the small bike pool, they dove in headlong. It isn’t a big bike, but it will have a sizable impact on the industry. 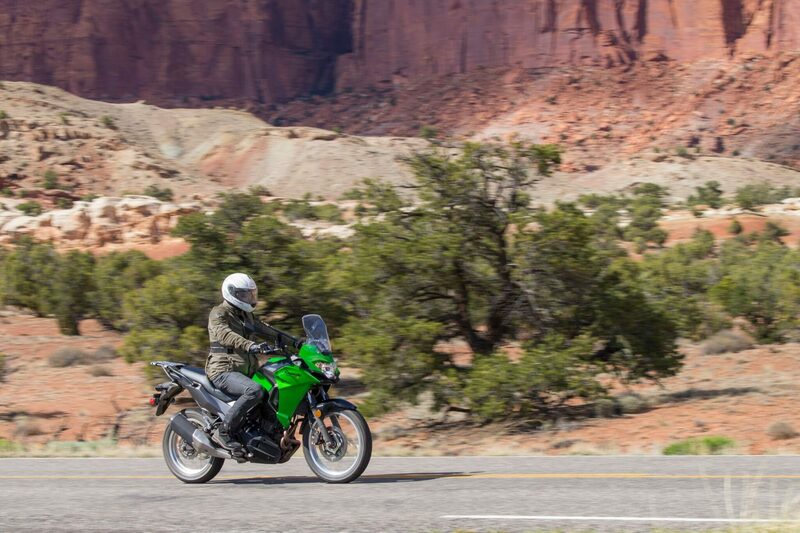 My first takeaway from the new Versys was how comprehensive the project was from the ground up. Although the 296cc parallel twin engine is borrowed from Kawasaki’s Ninja 300, the rest of the platform was engineered from scratch. 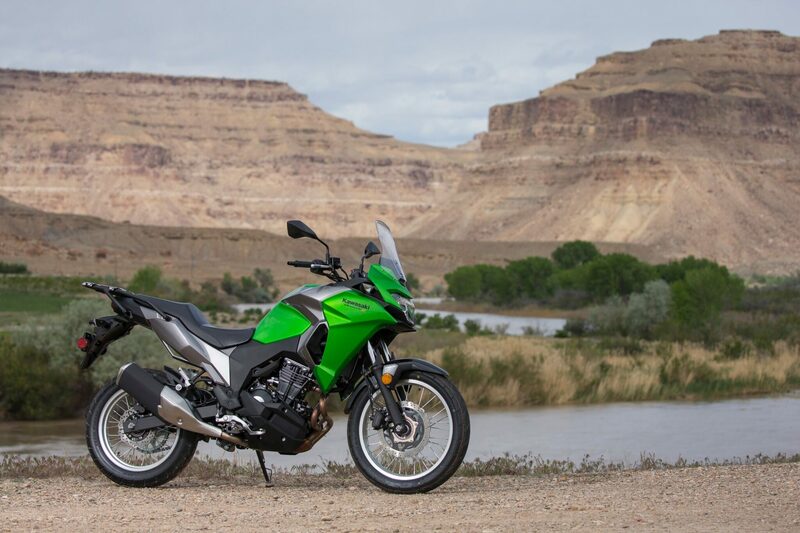 Heavily influenced by the Versys 650 and 1000 adventure bikes, the 300 is directed towards the same audience: the all-road rider looking for a comfortable steed for plying long miles over varied surfaces. To that end, Kawasaki nailed it. 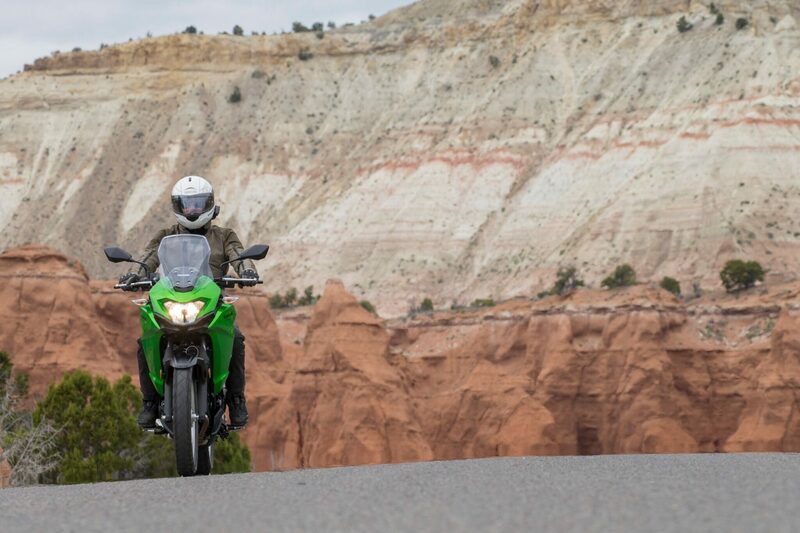 It’s important to first address what the Versys X 300 is—and what it isn’t. 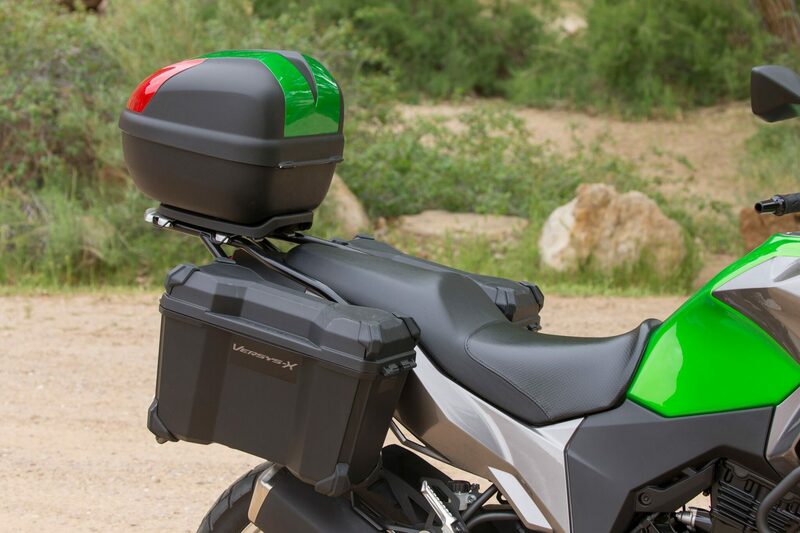 It is not a usurper to the KLR throne. 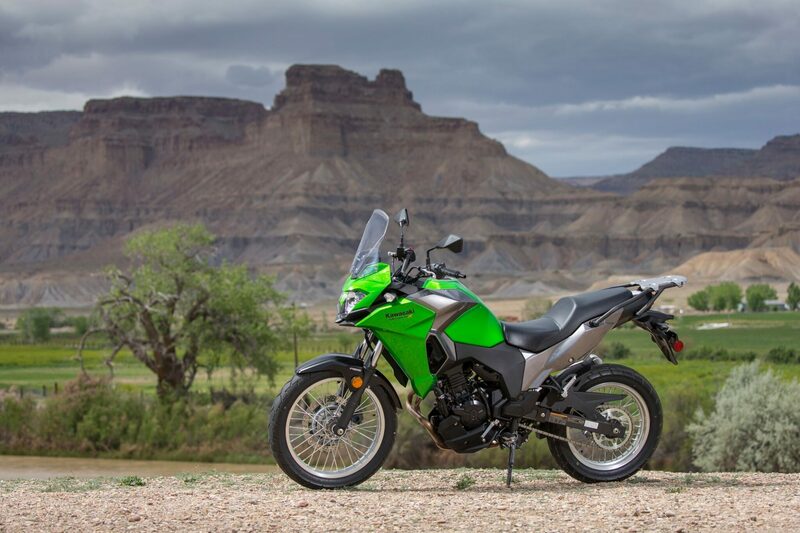 Just as the KLR helped define the dual-sport category, the Versys family exemplifies the new breed of machines best suited for tarmac touring with a little gravel and double-track thrown in to keep things interesting. 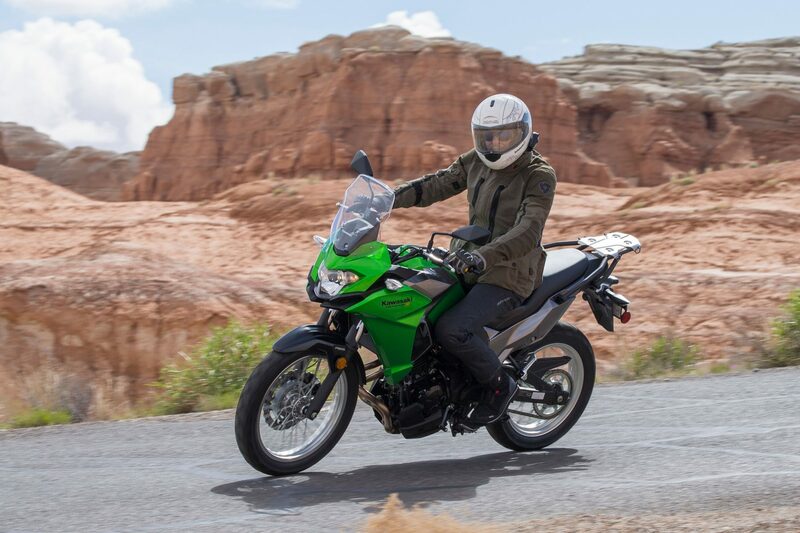 This is not to say a good rider can’t wiggle the Versys X 300 through sand, ruts, ledges, and other technical obstacles, but that’s simply not the domain of the new bike. If however you want to traverse any of the millions of miles of maintained dirt and gravel roads throughout the globe, the X 300 is your huckleberry. 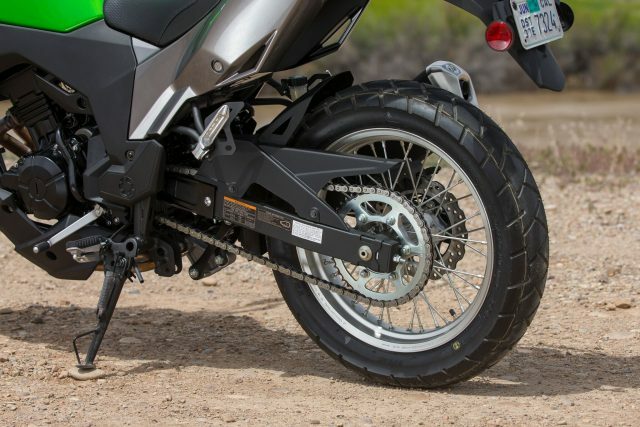 To achieve their any-surface objectives, the engineers at Kawasaki fitted the X 300 with a 19-inch front wheel, 17-inch rear, and paired them to 130- mm and 148-mm suspension systems respectively. 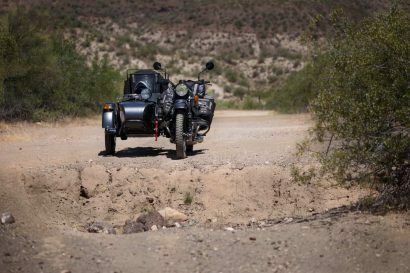 For most maintained roads, even those embedded with a few rocks, ruts, and corrugations, that provides ample travel for a controlled and comfortable ride. The spoked wheels are not just practical for touring unpredictable surfaces, they maintain the aesthetic many riders are looking for in an adventure-themed bike. Further blending form and function, the X 300 follows recent trends for aggressive edges and angular features, all packaged within a design providing maximum wind and weather protection. The windscreen sits high enough to punch a big hole in the air, a welcomed bit of relief when our second day of riding had us pushing over a 10,000-foot mountain pass still covered in snow. 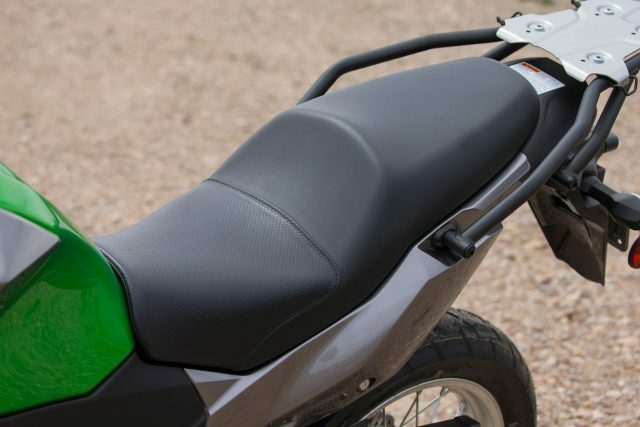 The tank and radiator cladding extends outward slightly to shield the rider’s lower half creating a touring-inspired ride without an excess of bulk. The wind protection is excellent. With its mission as a touring platform the bars are placed high, wide, and positioned for a comfortable reach. The seat has a relatively low 32.1-inch seat height which fit all of the testers in our group surprisingly well, with the smallest standing only 5’2” and the tallest at 6’3”. 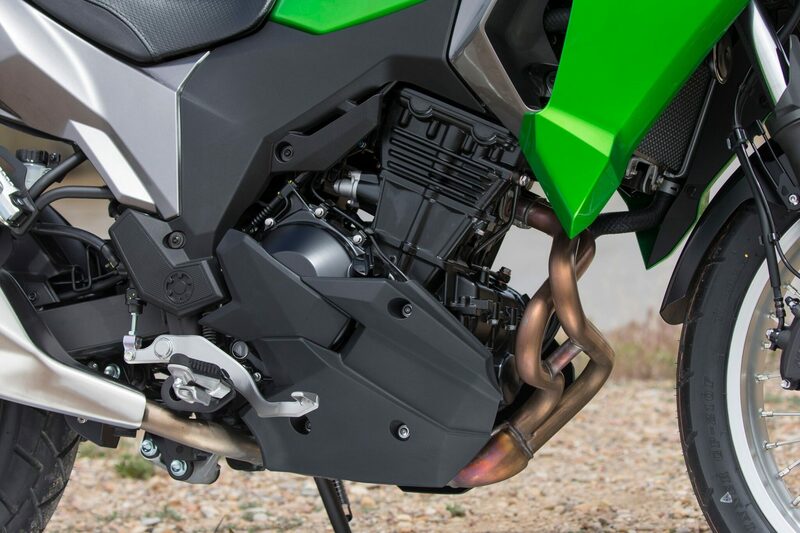 No bike fits everyone out of the crate, but Kawasaki did well to split the difference as best they could. For my 6’1″ frame, much of it legs, the fit was great although standing on the pegs made me feel a little scrunched over. 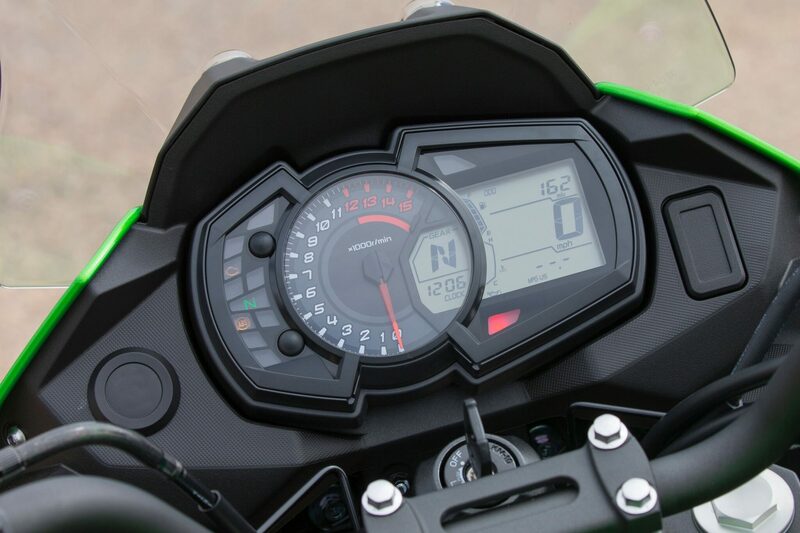 Other fine finishing details include a digital dash with a compliment of useful readouts for fuel burn efficiency as well as a large gear indicator and oversized tachometer. The tach made for fun spectating with useful power registering at 4,000 rpm and extending all the way to near redline at 10,000. More than just volume control, the bike accelerates through that entire sweep of rpm. To get to the question on everyone’s mind—how does it ride—let me just say it was a genuine surprise. Taken for what it is, a small displacement touring motorcycle, it rides amazingly well. Although light and unusually well balanced, it doesn’t feel small. It has a commanding presence and only a quick glance below the tank reveals the small volume of the motor. The rest of the bike is proportionate, comfortable, and easy to control. 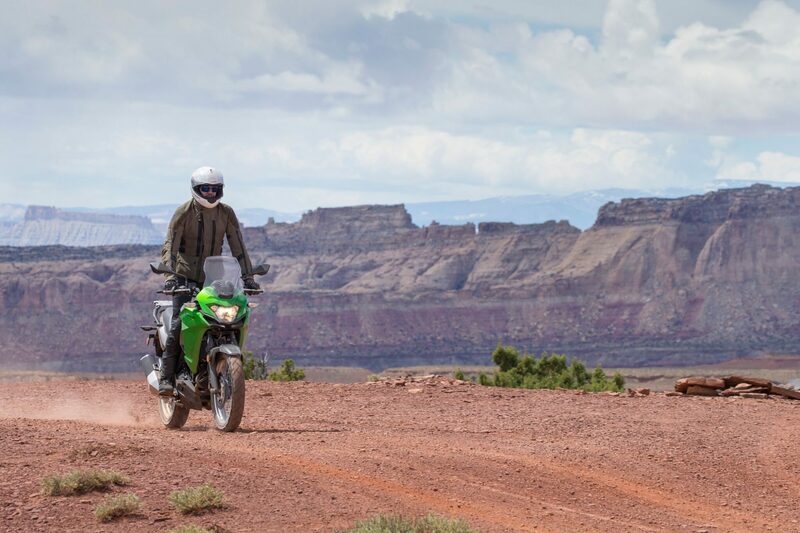 Only a few days after our trip through Utah concluded, a number of people have asked me about the engine performance. The most common query relates to the comfortable cruising speed and whether or not the 296cc motor has to be flogged like a donkey to keep pace. Before our group had even warmed our seats, we had our X 300s hurling down the interstate at 80 mph, no discernible indications the engine was under any strain. Rolling into the mid-80s, the tach needle climbed toward the 10,000 rpm digit, curiously close to redline, yet still felt composed and unstressed. The bulk of our miles over the course of two days were spent comfortably blasting along at 65 to 75 mph, a range of speeds which appear to be the X 300’s sweet spot. At that tempo, my digital gauge listed my fuel burn at an estimated 54 mpg. With the 4.5-gallon tank, that gave us sufficient range to not fret about refueling. Before rolling out of the parking lot for the first time, I had braced myself for a puny engine and molasses-slow acceleration. While the X 300 is no rocket, it will quickly zip up to speed with more than enough velocity to keep pace with fast traffic. Maybe more importantly, it’s quick enough to deliver the visceral feeling of acceleration we riders like. Not fast—but zippy. The twin even sounds sporty when revving high and popped through the gears. 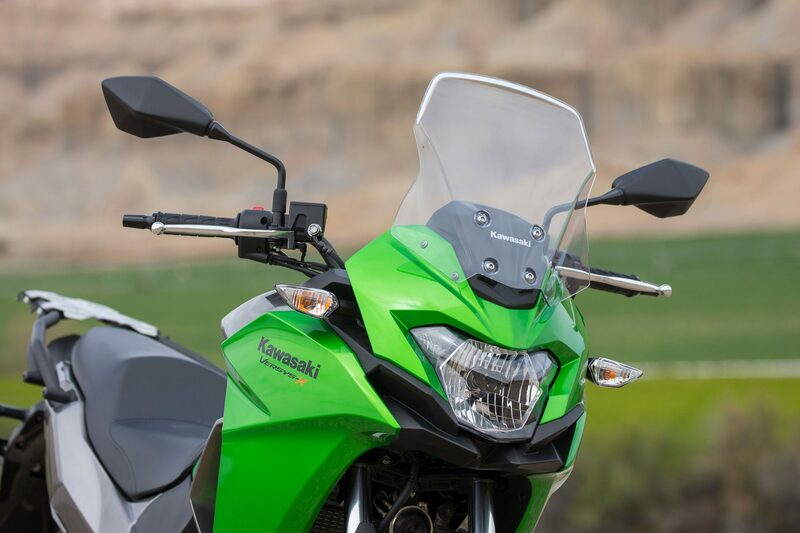 Kawasaki’s engineering team clearly understood the appeal of this smaller motorcycle within the new rider segment and made it as easy to ride and handle as possible. To that end, the new Assist and Slipper Clutch assembly gives the clutch lever the lightest feel of any I’ve ever experienced. Not even the worst stop-and-go city traffic could fatigue the weakest left hand. That combined to the nimble maneuverability made me want my own X 300 just for commuter duties. Despite the light clutch pull, the feedback is predictable and tactile. 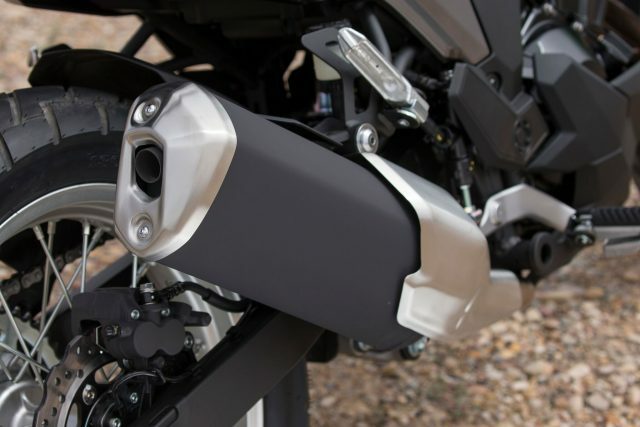 With the engine geared down roughly 9% below the 300 Ninja, the first gear on the X 300 is easily controlled, rolls along smoothly at a crawl, and modulates deftly with subtle clutch inputs. The transmission is equally smooth. 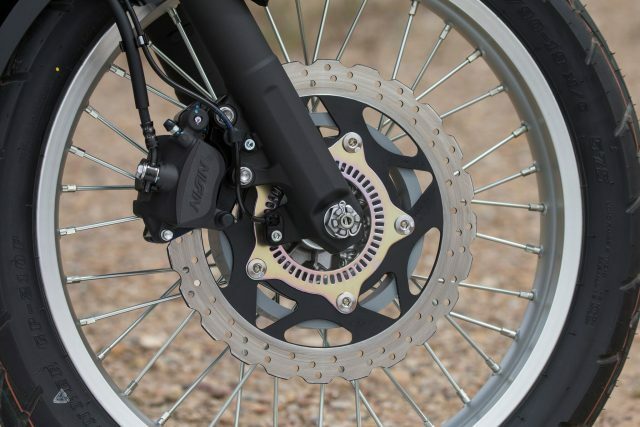 For a novice rider, bad shifts and tricky clutch work are a non-issue. For the experienced rider those benefits translate into less fatigue over the course of a long day. 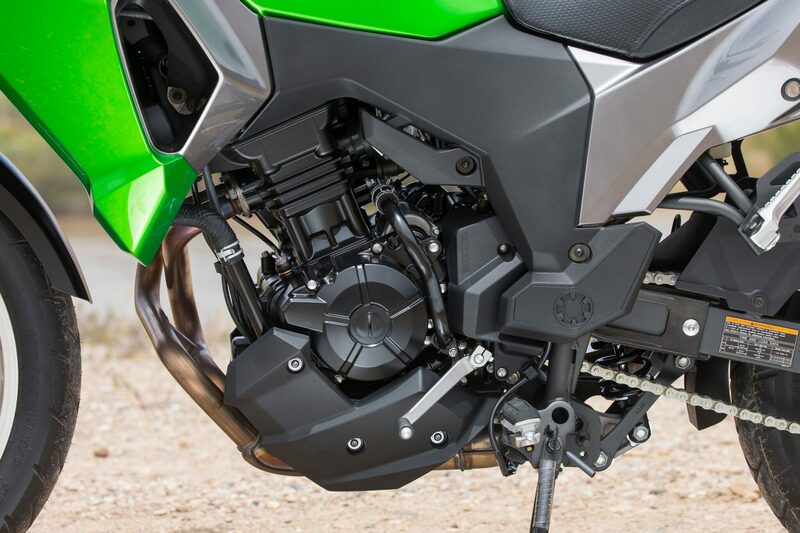 When designing the chassis for the new Versys, the Kawasaki team had the primary goal of making the frame as rigid as possible while keeping weight to a minimum. That stiffness is most noticeable when driving a hard sweeping turn, the frame and fork holding a predictable line with no vagueness or drift. 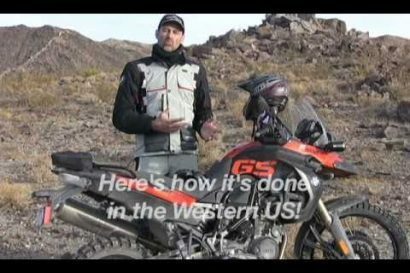 On rougher gravel roads, the front of the bike didn’t feel noodley and is piloted accurately around rocks and holes, even with the suspension actively stretching its legs. 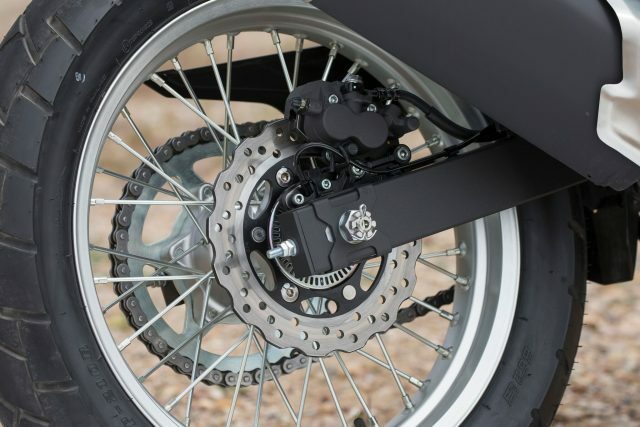 Also adding to the positive rider feedback was a crisp Nissin petal disc braking system, in our bikes paired to an optional Bosch ABS controller. 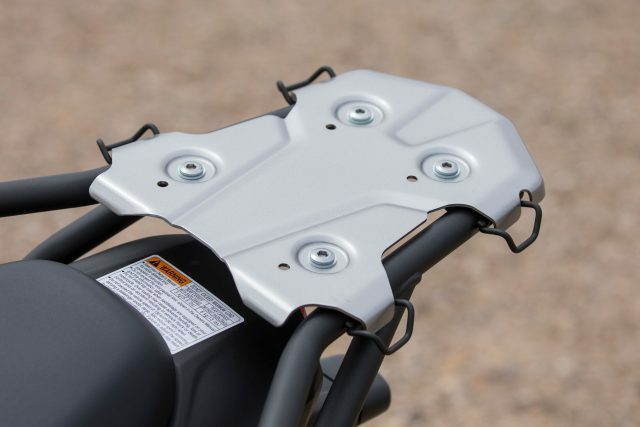 The non-switchable ABS system wasn’t too intrusive on loose surfaces, but will greatly benefit new and experienced riders equally on the pavement. In the hands of new and seasoned riders alike, the handling of the X 300 is one of its better attributes. 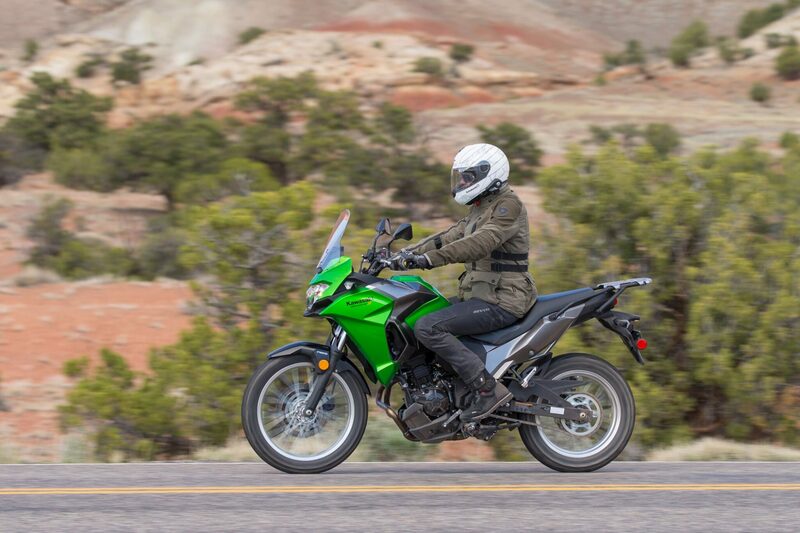 KLR enthusiasts have always marveled at the tarmac performance of an otherwise dirt-oriented bike, and the X 300 is even better. Hard turns are controlled, and again—fun. 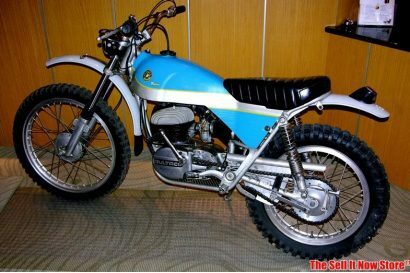 The motorcycle industry, and the general riding community at large, have long pigeon-holed small motorcycles as starter bikes only appropriate for the novice. Such stereotypical assertions are woefully misplaced. 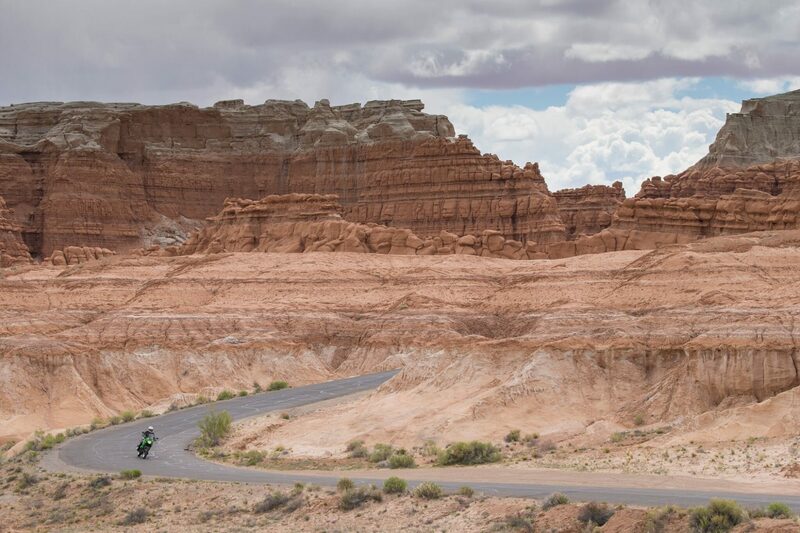 The light clutch, low weight, superb balance, and predictable control of the X 300 will obviously benefit a new rider, but they also make for a pleasurable ride for experts. If asked to navigate a loaded touring bike through a rough patch of ledgy two-track, I’d much rather do it on a light and nimble X 300 than a bloated beast pushing 800 pounds wet and loaded. I can also see one additional factor playing heavily into the eventual X 300 buyer: the price. At only $5,399 for the base model, just $300 more for the ABS-equipped bike, this is one of the best values in motorcycle offerings. 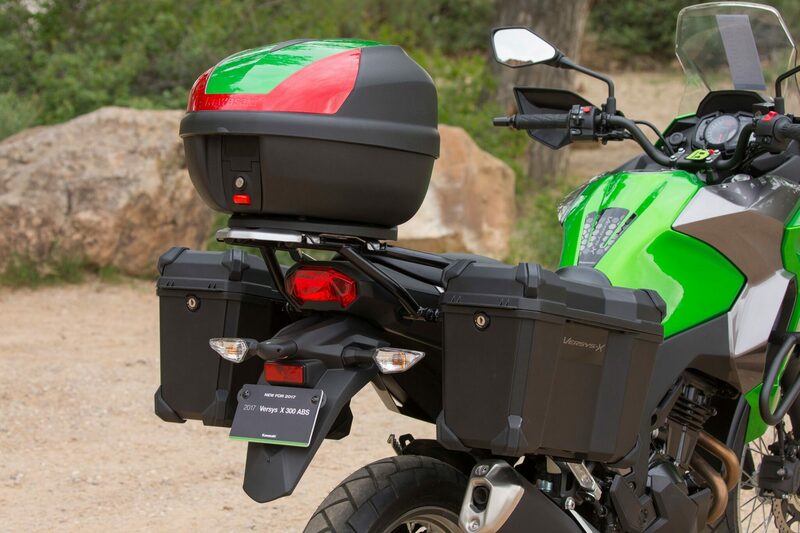 For those prone to go big, Kawasaki offers a comprehensive line of accessories including hand guards, crash bars, top case, accessory lights, upgraded saddle, center stand, 12V outlet, and even hard case panniers. That entire add-on kit only increases the price by $2,000. 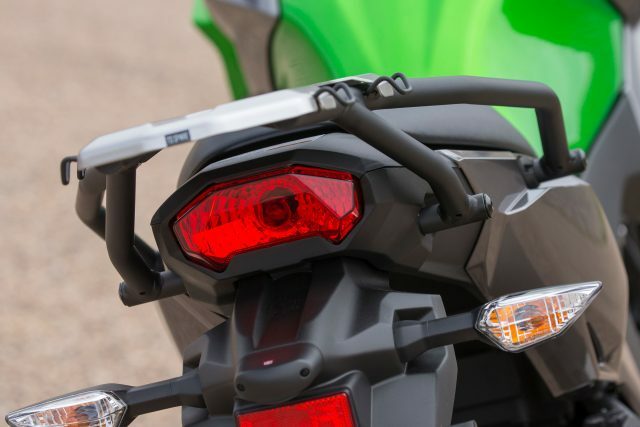 Better yet, all of those accessories, including the crash bars, can be installed in minutes. 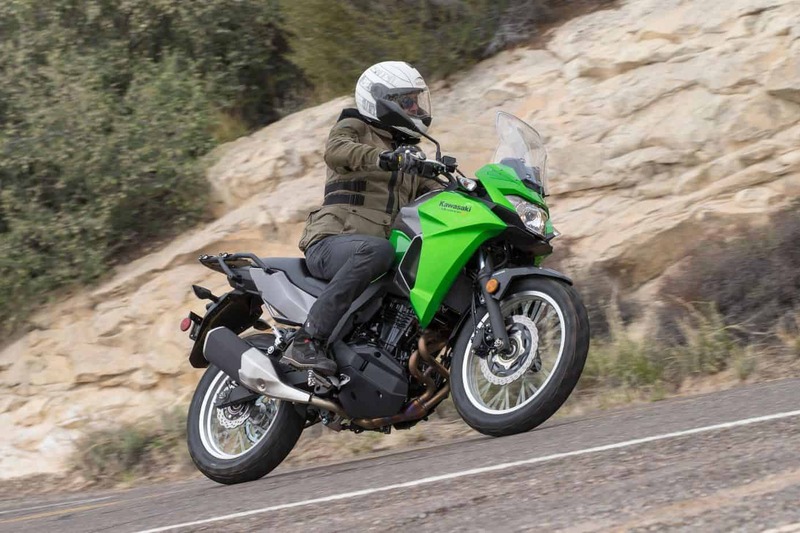 There will be riders to dismiss the smallest Versys based only on its engine displacement. They will inherently assume the X 300 is slow to accelerate, must be hammered continually to maintain cruising speed, and given its low price, will feel cheap. Those people will miss out on a great machine. 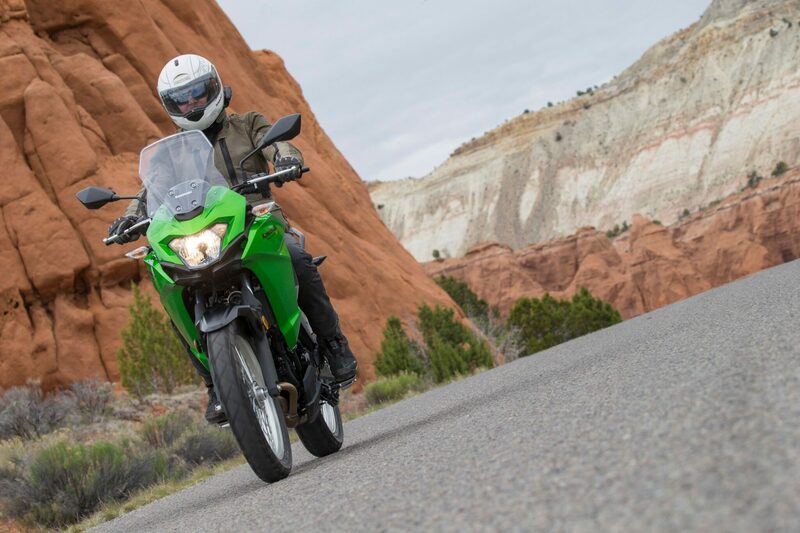 If the Versys X 300 is anything, it’s swift, easy to ride, well appointed, comfortable, and a killer value for a motorcycle capable of big adventure at a small price. 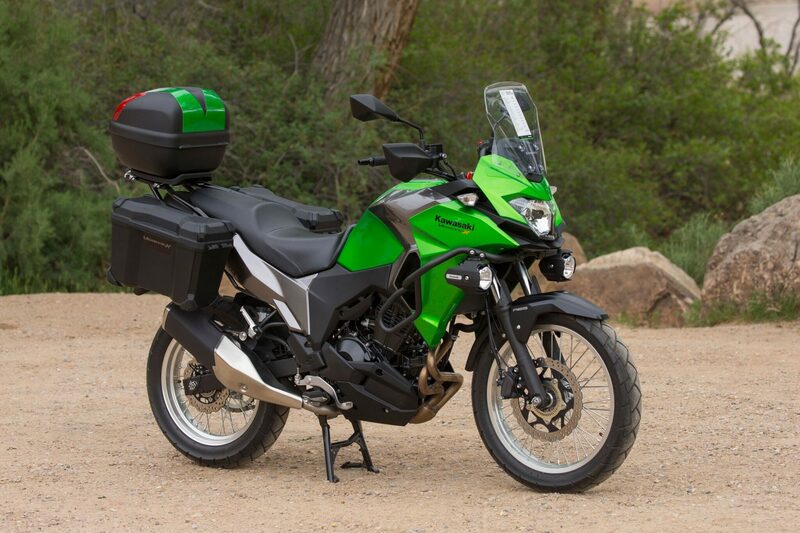 I know myself well enough to concede I’ll likely add a Versys X 300 to my garage under the auspices that it will be a fantastic bike for my wife, which it would be. I also know I’ll likely put more miles on it than she will because at the end of the day it is simply a hoot to ride.